Join Sun Palace casino to celebrate new slot release. 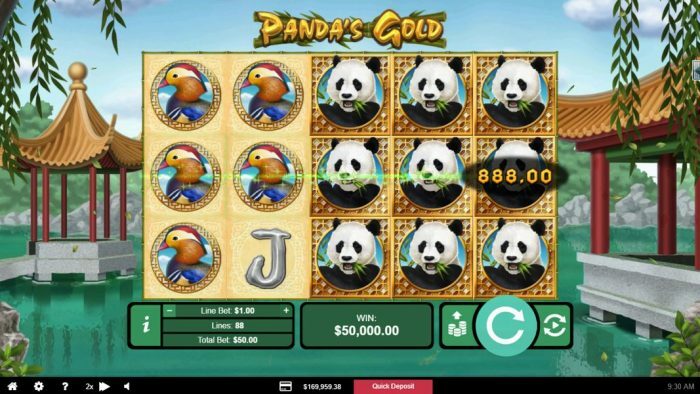 Panda’s Gold is an exotic new slot from Real Time Gaming, which plays at 88 lines for a 50 line bet! As an incentive, you get 200% deposit bonus and 10 free spins on Panda’s Gold slot on top. Deposit $100, play with $300! Live Dealer Games, Black Jack, 21 Games, Craps, Vegas Three Card Rummy, Tri Card Poker, Caribbean Draw, Caribbean Hold’em, Caribbean Stud, Baccarat, Roulette or SicBo or Progressives games cannot be applied to the wager requirements. Sun Palace casino T&C apply, please read before playing. 200% deposit bonus and 10 free spins can be claimed unlimited times.